While I was talking the photo of the herbs, the mystical green birds were squawking at me. Maybe you guys can help me dispel the mystery. There are green birds that will no joke fly over your face multiple times a day, and they look like parrots? The Pilot and I thought perhaps they had escaped from a zoo or aviary, but nope. They belong here. As you guys know, I’m not a huge bird fan but I do like the green parrot-things. Yesterday was a pure strength day for training and classes. I took a barre class as part of my teacher training and had a short workshop afterwards. (San Diego locals: I may be teaching a free community class as my first one on the floor, so I’ll let you know in the next couple of weeks!) Then, later that afternoon, I went to observe a BodyPump class to study up for my certification. Get this: class had over 80 people! I’ve NEVER seen that many people doing BodyPump at once, so it was pretty incredible. It ended up being fifty shades of fail for me because I hit major traffic on the way to class and drove around for 15 minutes trying to find a parking spot at the gym. (I ended up having to do the creepy thing where I followed a girl from the gym to her car so I’d finally get a spot- it was that packed.) Needless to say, I was a couple of minutes late, didn’t want to disturb anyone by setting up my stuff, so I sat in the back to observe and take notes. I’m hoping to knock out part two of my BodyPump training next month! For your lateral lunges, be sure to sit your hips back and keep your chest lifted. If you’d like to change the tuck jumps, feel free to do faster bodyweight squats or jump squats. During your mountain climbers, really use your core strength to bring your knees in towards your chest or towards your elbows to engage the obliques. For the Warrior 3 tap and lift, you’ll lean forward with arms extended, lightly tapping your back leg to the ground. Use your glutes to lift up to a Warrior 3 position, and endeavor to keep your hips parallel to the floor. For ALL of the exercises (especially the fast ones) be sure to focus on quality over quantity. Take a breather if you need one so that your form doesn’t suffer. As always, check with a doc before making any fitness changes and honor your body. Modify if you need to. Don’t you love watching a packed class like that? The most I’ve ever taught in BODYPUMP was 75, and that was in a huge gym back in Orlando. The city gyms I teach at now in San Francisco have MUCH smaller group fitness rooms, and not enough equipment for that many people. Have you tried filming yourself teaching BP yet at all? You should even do a few practice runs at home without all the weights so you can pick out what you need to work on. It usually takes a couple of times to get it right. Best of luck!! LOL @ the creepy thing!! Oh the green parrots! they are actually wild. the common belief in OB is that people let their pets go and then they just breed like crazy. there are tons of them!! they’re pretty but come summer they are super loud in the morning when you are trying to sleep in. We have those parrots in LA too! i live in the los angeles area and we have spotted random parrots in our neighborhood, as well. they’re cool looking, but sometimes they can be SO loud in the morning! Wild parrots! We used to have a flock of them by our place in Pasadena. They’re noisy but fun. this might be a silly question…but is the 30 seconds slow of each movement the “off” portion of the 30 sec on 30 sec off? 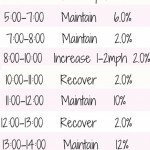 So for active recovery, do we continue with the exercise at a lower intensity or just catch our breath? continue with the exercise slowly and breathe to get your heart rate down. My craziest bird story: when I was little, I had crazy long, curly thick hair that used to get tangled quite easily. One time I was outside and a bird was flying around and decided to land on my head and kind of got caught in my mop of hair. It was flapping around and I was screaming and my cousins were on the ground laughing. The bird eventually got out and it was totally fine, but I was scarred for life. Kidding. Kind of. Anyway, I’m better with birds now and those parrot birds look pretty cool! (As long as they stay away from my hair!) Have a great day, Gina! Oh and I hope your jalepeno plant grows well this summer! Can’t wait to try this Friday! 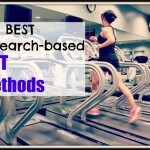 I love HIIT workouts, especially no-equiptment ones! Can’t wait to get my sweat on with this one! 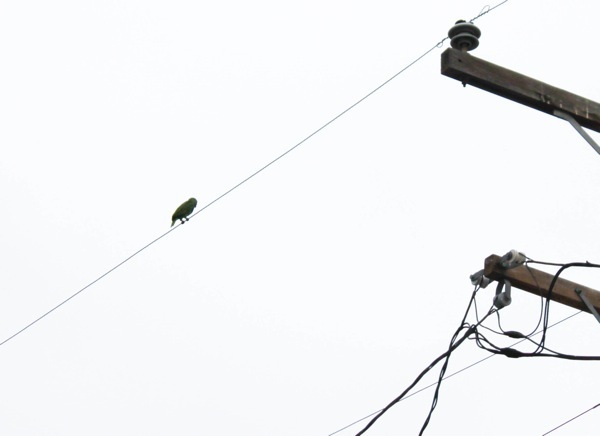 I was surprised last year on a business trip to London, England, when I went for a run and saw parakeets in the park. The Brit parakeets are smaller and have long tails and are a beautiful yellow and green. A little googling came up with an answer–they started out as cage birds in Victorian times that were either released or escaped and are now established in some of the London parks and gardens. I thought it was pretty cool. Miami also has “wild” parrots. The parrots are actually an invasive species and pretty harmful to the San Diego ecosystem (they compete with native species and can do some major damage to some trees). They could have been released as pets (it is one scientific theory) but they primarily think that they have migrated from Mexico (where they are actually a native species) due to deforestation of their natural habitat. 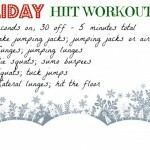 HIIT workouts are my favorite!! can’t wait to give this one a try. random, but i think you have done a post on your favorite workout clothing?? after baby #2 i’m FINALLY trying to get back into my old workout routine and i’m looking to add a few new lulu pieces as incentive. 🙂 could you share your favorites? thanks!! Aaah, the OB Airforce! If the first planes at 6:30 am don’t wake you up, the parrots will! Never fails! 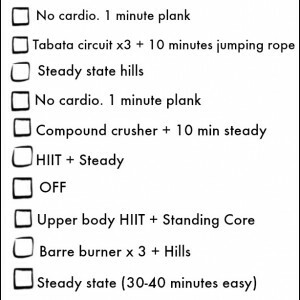 I love doing HIIT workouts especially when I am pressed for time. Can’t wait to try this one! We have parrots here in Phx, too. Love birds. Awesome! 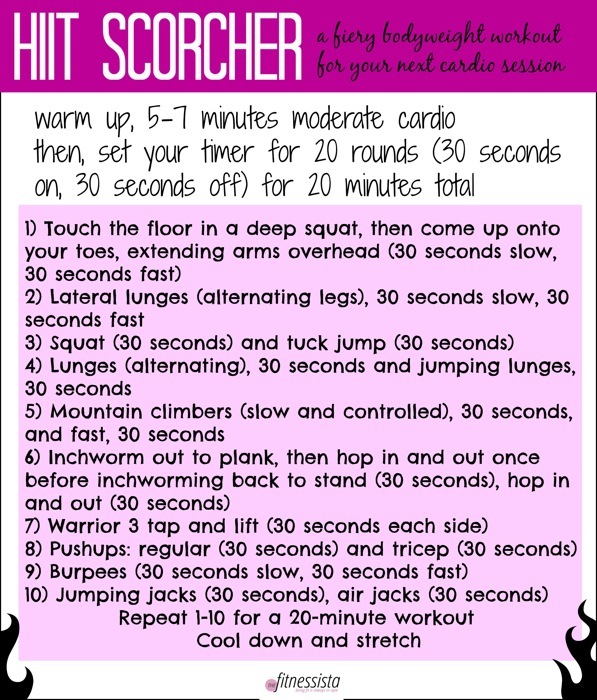 I love HIIT workouts like this! You just planned my workout for tomorrow 🙂 I bet the warrior 3 tap and lift is a great glute burner! I worked on my handstand for a bit, too! Still haven’t mastered but I’m closer!! HIIT workouts are my fave!!! I like to change things up with cardio, so this will be getting used for sure. SUPER cute workout clothes, ugh, I just can’t get enough! My husband and I used to live in Point Loma and those birds lined up outside on the telephone lines every day! We have a photo of approx. 15 of them sitting on a line. Crazy. Interesting to learn from other readers that they are actually an invasive species. I’m not a bird fan either and I would be terrified if they flew over my face! lol. There are tons of crows and pigeons in Seattle but I never get near them! 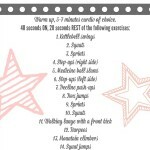 Thanks for sharing the HIIT workout with us! I always enjoy trying new HIIT exercises! Yes! Parrots!! We have them up here in the San Francisco Bay Area too! They are LOUD. I first discovered them by my Trader Joe’s. I thought I was crazy but the store had them included in their wall murals!! I think those green birds are called Quaker Parrots! Love them! Wow that’s a ton of people in a class. I can’t even imagine! 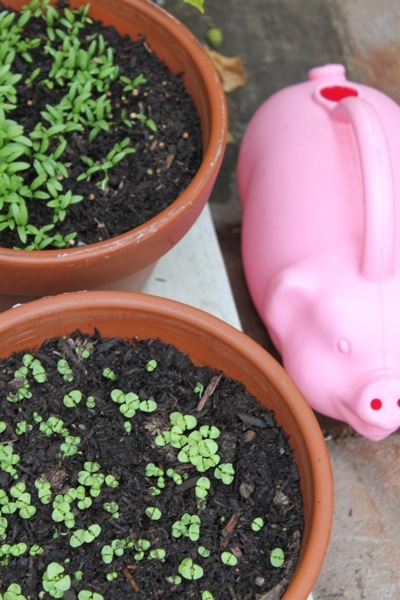 Are you planning to teach more classes once you get certified? On the HIIT, do you do cardio ie 30 minutes before or after? This was a killer workout!! I am elated, sweaty and full of joy. I will definitely be doing this one on Friday again. Thank you for making my day better! thank you so much for letting me know you enjoyed it! Body Pump is so much fun with that many people! There are 3 sisters who teach at my gym that regularly get around 80 people, I think 100 is the most I have seen! It is amazing, we have to turn our bodies to the side for lunges! The energy is definitely there with a packed class!!! San Diego native here! 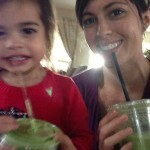 Would love to meet you at your free class. haha! there are a lot of unique things about this spot. i’m loving reading about all of the theories about the birds! Cant wait to try this! What kind of timer do you use to time your intervals? 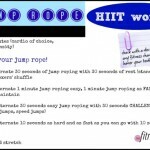 I love HIIT workouts! Can wait to try this one. Everyone is capable of doing this because there are no equipment involved. No excuses! We have birds a lot like that in Austin! I was SHOCKED the first time I saw them. Ours have their own yelp page, lol! It’s hard to tell if from the photo they’re exactly the same species, but if you want to learn more you should google monk parakeets to see if it’s the same. when it says 30 slow and 30 fast, the first round is slow and the second is fast right? 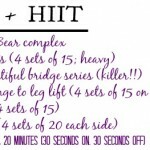 Did this HIIT round on Tuesday and it KILLED me, loved it!